Seeking Hearth Retailers for the PFI Social Media Beta Test - Reserve a spot for your favorite retalier today! Sponsor a customer today. There are limited spots available and we are gearing up for pellet season so don't wait sign up! The Pellet Fuels Institute Promotions & Communications committee is seeking sponsorships for a social media beta test occurring during the 2018-19 heating season. The program is designed to test the use of social media to increase consumer awareness of heating with wood pellets within specific market areas. Participants will have social media messages generated by PFI staff and delivered to selected consumers in their market area via existing retailer Facebook and Instagram platforms. A Pellet Fuels Institute producer member identifies and sponsors a specialty hearth retailer willing to participate in the beta test and sponsors their participation. The price to sponsor a retailer is $1,500. This fee covers a four-month advertising budget and PFI's administrative costs. To participate, the specialty retailer must have or be willing to create Facebook and Instagram profiles. PFI staff and contractors will create and post content targeted to social media users within a 25-mile radius of the retailer. The posts will be intended to increase both the consumer's awareness of wood pellets as a home heating source and the specialty retailer as a resource for purchasing pellet appliances. PFI staff will work with the retailer throughout the duration of the program to align content with special promotions at their locations while also working through the strategic messages developed by the Pellet Fuels Institute. PFI staff will mine the social media platform analytics to determine which of the tested messages were most effective with selected audiences. The program is available to producer members on a first-come-first-served basis. There are ten sponsorships available. Please send an email to [email protected] with the subject line "WILLING TO SPONSOR" to reserve your sponsorship today. We look forward to working with you all to build visibility for pellet heating! Thank you for your support. Yes. The cost of the program covers both a monthly ad budget of $100 for a 4-month campaign and the cost for implementing the program. The cost for the full 4-month beta test is $1500; the pellet fuels manufacturer and retailer are welcome to split that cost in any way. We're building a collection of photos of our members, their pellets mills, and product. Send them to Carrie Annand at [email protected]. 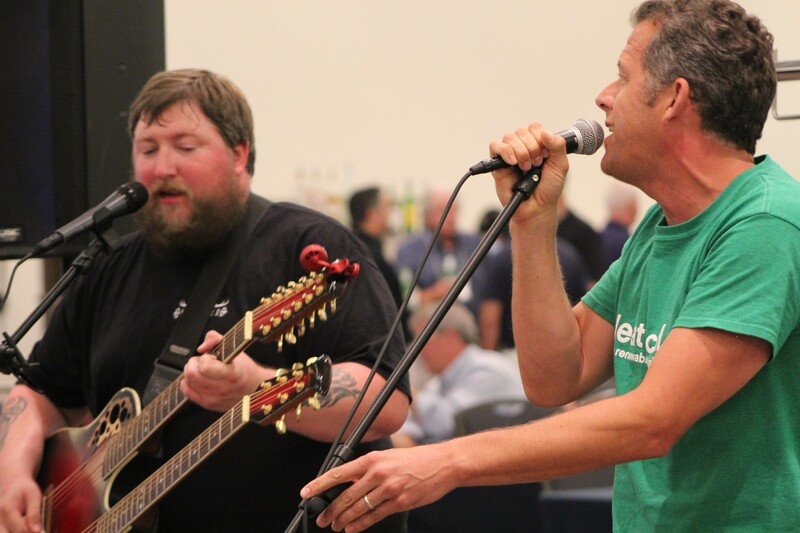 This week's featured photo from the PFI Annual Conference shows Energex's Adam Becker and Tim Portz entertaining the crowd at the reception. Pit Boss Grills (Dansons, Inc.) is announcing a new patnership with BBQ Bob, an unofficial "BBQ Celebrity" and the man credited as being the Godfather of Pellet Grills. Born and raised in St. Joseph, Missouri, Bob found his barbecue roots early on, and helped create the barrel lid that pellet grills are known for today. Not only has BBQ Bob won many a BBQ competition, he has also cooked at a legislative picnic, championed pellet grills into the future, and helped raise national awareness for the pellet grill segment. "I am proud to be a part of a company that is helping make a 200-year-old tradition available to everyone," said Bob. "Not only are Pit Boss Grills Bigger, Hotter, Heavier than other pellet grills out there, but the company has a solid foundation in family and friendship." Renewable energy advocates are pushing a 21st century upgrade to an ancient technology — wood heating — as as a way to meet Vermont’s renewable energy goals while revitalizing the state’s struggling forest economy. Susan Clark purchased a pellet boiler a few years ago to replace an aging oil furnace at her central Vermont home. At a press conference Tuesday, Clark said the lower cost of wood pellets compared to the oil she had been using will eventually make up for the almost $20,000 price tag for the purchase and installation of the boiler. Advanced wood heating systems — pellet boilers and stoves, and wood chip boilers — produce significantly less air pollution while generating heat more efficiently than their traditional wood stove counterparts. Clark said that heating with a wood pellet boiler has “all the advantages of oil in that a truck comes to your house twice a year and you’ve got fuel” with none of the dust associated with wood stoves. She pointed to a hole on the side of her house where delivered pellets are sucked through a pipe into a storage tank in her basement. They are then automatically fed into the boiler to heat her house.